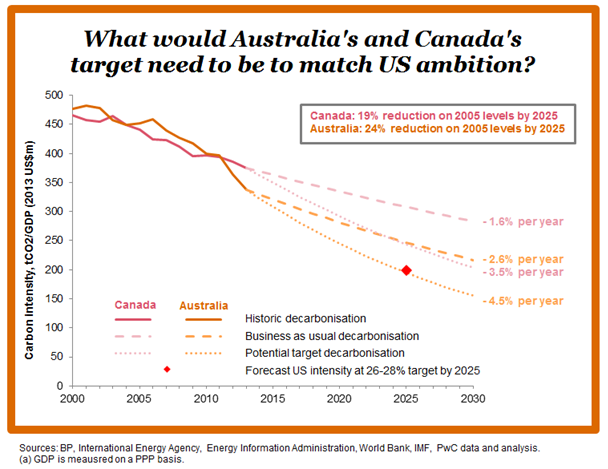 An analysis published 11 May 2015 by PriceWaterhouseCoopers estimated the target that Japan, Canada and Australia needed to meet to achieve the same level of ambition as Europe or USA. We know these countries still aren't doing enough to achieve 2C target, yet they still set a benchmark for other industrial countries to also match. The EU committed to a 40% reduction on 1990 levels by 2030 and the US a 26-28% reduction on 2005 levels by 2025. 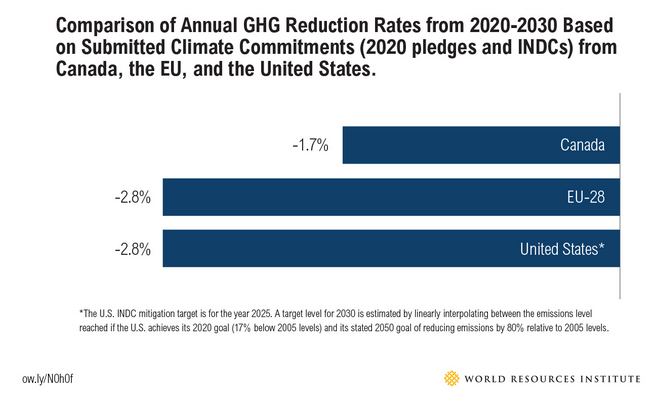 "Our LCEI report in 2014 showed that global carbon intensity is falling by around 1% per year, but that this needs to be 6% per year on average to stay within the 2 degrees carbon budget. All these targets fall well short of the 2 degrees goal." reports PriceWaterhouseCoopers. Read more on their analysis here: What would Japan, Canada and Australia’s targets be if they are as ambitious as the EU or US? Since the PriceWaterhouseCoopers analysis was published Canada has put forward it's INDC to the UNFCCC. It has set a target of 30 per cent reduction on 2005 levels by 2030 and that offsets may be required to meet this target. There was a high degree of criticism that this target is not nearly ambitious enough and does not match the targets of the USA or Europe. “These targets are a nice gesture, but for now that’s all they are, because the numbers here simply don’t add up. There’s no way Canada can hope to cut emissions by a third while this administration is still pursuing every possible opportunity to dig up the tar sands. Scientists have told us over and over that averting climate disaster means leaving virtually all tar sands in the ground; and until our government starts taking real steps to achieve that, these announcements are little more than pie-in-the-sky PR.